We’ve all been there — you’ve got your tea, your freshly poured soda, or even just a glass of water recently cooled to the optimal drinking temperature with a few cubes of ice, only to discover that your drink now has a strange taste. There’s an odd tinge to it and you wonder if maybe your drink has expired — until you realize it’s the ice that’s tainted your tasty beverage. From the food you’re storing to the water filter in your fridge, there are a lot of factors that could be causing your ice to taste funky. However, if you suspect you’re having more serious issues with your fridge, give us a call at Omega Force Appliance Repair in Twin Cities for refrigeration repair. Refrigeration and freezer companies do extensive testing on all of their products before they’re sold to distributors or customers. This includes extensive taste and odor testing. Refrigerators and freezers are not built with any mechanical parts that will produce an odor or cause your ice to taste or smell badly. If you suspect that a part of your fridge is still malfunctioning, contact Omega Force Appliance Repair in Twin Cities for comprehensive refrigeration repair. For many reasons, you should always store food in your refrigerator in a sealed container — the smell that your food gives off and transfers to other products is one of those reasons. When you leave food uncovered, the smell travels throughout your refrigerator and, yes, even into the freezer. If you spilled food and haven’t cleaned it up either, this will also cause a smell or taste in your ice. Cover the food in your fridge and clean up spills quickly to prevent the spread of odors. If you don’t use ice very often, it still stays frozen in your freezer, absorbing food odors. The longer you leave ice in your freezer, the more time it has to absorb odors from other food you’re storing. If you find you’re not going through ice very quickly, like in the Winter, consider throwing the stale batch out and let your freezer start fresh. 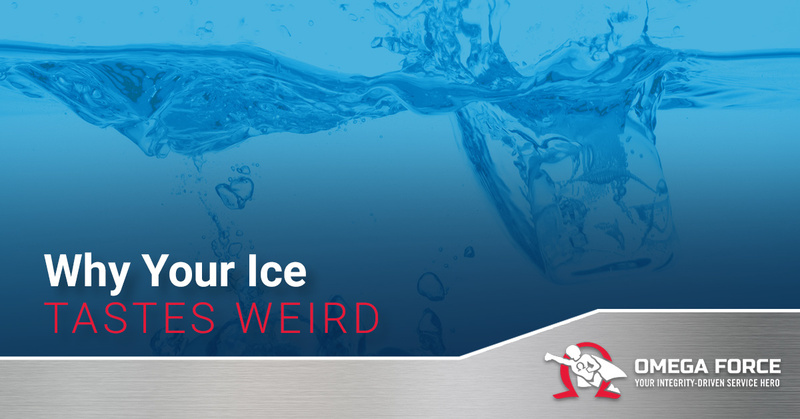 If your water isn’t being filtered or isn’t being filtered well, it could be causing your ice to taste weird. Your water supply could contain a variety of things like sulfur, algae, minerals, salt, and more that are causing your ice — and your water as well — to taste off. If you live in an area with hard water, consider installing a filtration system in your home that removes those harder minerals and contaminants. If your freezer has an ice maker and/or water dispenser, it has a water filter like the one mentioned above to make sure your water and ice is clean and enjoyable to consume. The filter needs to be changed periodically. However, if you think you’re having issues more serious than an old water filter, contact Omega Force Appliance Repair in the Twin Cities for our refrigeration repair services. No one should have to settle for a sub-par drink just because the ice you’re putting into it tastes funky. Take steps today to rid your freezer of odorous ice — clean up spills, seal uncovered food, throw old ice away, get a water filter for your home if you have hard water, and replace the water filter in your fridge if it’s old. By taking these steps, you’ll be on your way to enjoying the refreshing beverages you deserve.